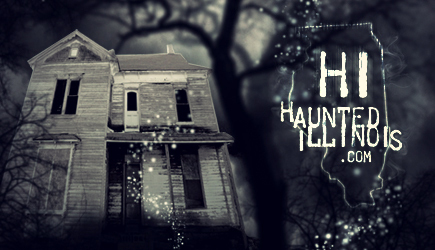 Visibility/Location: Evil Intentions Haunted House is located just a block off of US 20, so the location is easily accessible. There are enough cues outside of the attraction to make its presence known; such as a large banner on the building, a school bus with another banner and colorful lights, a large projection screen aimed at the side of the building, and loud music playing. There is a pretty large parking lot directly across the street, but I have seen that parking lot filled to capacity on peak nights. Such was not the case on the Sunday that we visited. There are large spotlights and another banner at the entrance of the lot making it obvious that the lot is intended for customers. Wait Entertainment: We were kept occupied by multiple costumed characters that were incredibly interactive, disturbing and witty. These characters were scattered from the parking lot to the exit of the building and everywhere in between. The ticket booth area is in an elaborate haunted funeral home scene, and the waiting area is a maze of chain link fence filled with coffins and little passageways the actors can sneak through to get to the crowd. They have loud heavy metal playing in the waiting area. We did not experience even one second of boredom while anticipating our admission to the show. Crowd Control: The crowds were split up very well by the staff. We did not run into another group and another group did not catch up to us. If we hadn't just been standing in line with other groups of people waiting to get in, we would have thought we had the whole building and experience to ourselves. After our entertaining wait, our group of four was brought into a room where mannequins hovered around us while two actors read the rules to us. Once we agreed to abide, we were sent into a room and instructed to surround a bar height table covered in remnants of a sacrifice. We partook in a ceremony while ominous characters invaded our personal space and eventually allowed us to proceed. From there, we entered a vintage elevator wherein we were given the option to go up or down. We chose down and we experienced a loud, harsh, jolting ride that we thoroughly enjoyed. After the elevator, our equilibriums were completely thrown off and we were immediately met with hallways and rooms that challenged us to stay on our feet. The actors had multiple nooks to hide in and jump out of. Some of the actors were very interactive and followed us, while some jumped out at us and reset for the next group right away. One group of actors that deserve an honorable mention is the acrobats that occupied the cage maze. I walked ahead of the rest of my group and stopped to look back. I saw two of the actors flawlessly transform into one massive, towering character within just a second before my friend reached them and looked up at them. While I was watching that unfold, three other actors had climbed over to where I was standing and got into my personal space. Another memorable area is the hospital in the basement. The scenes were detailed and the actors were very good at staying in character for extended periods of time. Some of the rooms had windows that we could look into before and after we had walked through, and the actors were consistently doing their thing the whole time. "The doctor" was one of the highlights of the whole show. He stopped us in his operating room and calmly explained what he was going to do to us while sporting a disturbing grin. Even through our commentary, he focused on his character and maniacally laughed as we escaped his attention. Exiting the medical area, we came into a dark, musty hallway with a light at the end of it. We followed the light and eventually had to move quickly toward the exit to escape the intense weapon yielding actors that were attacking us from multiple angles. We came across an outdoor area where we walked along a path and were eerily watched by characters in plague doctor masks. We entered another building and climbed through a two story foyer into a sinister chapel where one of the actresses presented me with the best surprise of the night. Some other scenes that we walked through consisted of a rustic burlap maze, a tunnel covered in creeping vines, multiple industrial work spaces, hallways overtaken by complete darkness, claustrophobic passageways, and a disorienting maze with walls resembling toe pincher coffins. The actors in all of the spaces throughout delivered their scares and used their spaces well. For most of our trek through, we were serenaded by loud noises and heavy metal. 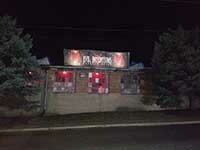 Evil Intentions Haunted House is one of a kind. The naturally decrepit, aged, and once abandoned casket manufacturing plant is the perfect backdrop for their dark and twisted production. Their actors and characters are unique and engrossing, their settings are chilling, and their assault on the senses is piercing. I would recommend Evil Intentions to anyone that is looking for an intense and relentless haunted house this year.